Last month I ordered two Michael Jackson dolls from Play.com and they both arrived packaged in nothing more than plastic bags, naturally damaged. I complained to Play.com, obviously, and was told by the Play.com complaints team that I needed to wait in for the damaged items to be picked up, and that they couldn’t guarantee that the items would be resent packaged properly. The Thriller doll arrived well packaged, in a box, with protection, delivered by our friends at HDNL. Nice job. 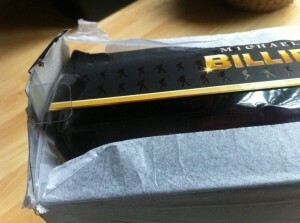 The Billie Jean doll however arrived packaged in a plastic bag, delivered by Royal Mail, and crushed – again. I have now sent the following email to Play.com complaining about the state of the replacement item. This dance will continue until they get it right, or until I get tired of complaining… I think we know which one will happen first. I have just returned from the Post Office after collecting this item, where once again I find that it has been packaged in a plastic bag. This is the second time you have attempted to send this item to me, and the second time that it has arrived damaged. I initially ordered this and a Thriller doll, both arrived damaged in November. I complained to you, you told me to phone your expensive 0845 number, which I did. The woman on the phone said she couldn’t ensure that the replacements would be sent out packaged correctly, which astounded me. I then waited in for HDNL to collect them, taking a day off to do so. The Thriller doll arrived in perfect condition, packaged in a large cardboard box (the original box used by Character Options to deliver the dolls to you in the first place) – you know, the sort of box ‘designed’ to ensure these figures arrive undamaged. The Billie Jean doll however was once again dispatched in a plastic bag, despite there being room for two dolls in the aforementioned cardboard box. The doll has arrived, once again, damaged. This is not good enough. I want the item I paid for in a condition fit for sale. This will not be good enough either. I expect to be compensated for this shoddy service, for my repeated phone calls and for my time waiting in for someone to collect a parcel, twice, that you should have delivered correctly the first time. I await your automated email with baited breath. Previous PostJE James Cycles dumps Home Delivery NetworkNext PostLambrini girls just wanna be original? Have you seen the latest reviews on ciao regarding play, as the months go by I am progressively seeing more and more negative reviews on them….. Can see them going the same way as several other digital media stores/outlets….